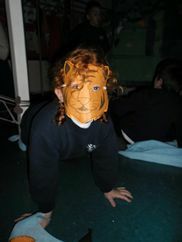 Tigers and Kangaroos have been working during this last month on one of our favourite topics: "Endangered Animals". *Sea turtles eat plastic bags, confusing them with jellyfish and sea weeds, so please do not throw them into the water. If we pollute the water, the sea turtles die. We must look after our environment, and be careful with where we put our rubbish. *Elephants get killed because of their ivory tusks, so please do not buy anything that is made of ivory. *Pandas are in great danger because they only eat bamboo, and bamboo forests are being cut to make houses. Deforestation is a great problem for gorillas as well, because they do not have a place to hide from the hunters, who kill them for their fur. The rainforests are also being destroyed, and trees are being cut, leaving the guacamayos with no place to make their nests and lay their eggs. We investigated how they were made by looking at different kinds of brochures and what information they contained. Then we split up in groups, where we talked and prepared the page of the brochure which gave information about one of the animals and everybody participated by making drawings or writing facts to communicate to the Bears, Bunnies and Ducklings the importance of looking after our animals, and of course, our planet, our big house where we all live together.